The TYIN Architect’s Toolbox™ contains the tools needed to create useful, beautiful and necessary structures in any circumstance. TYIN Architect’s Toolbox™ is mobile, sturdy, practical and simple to use. 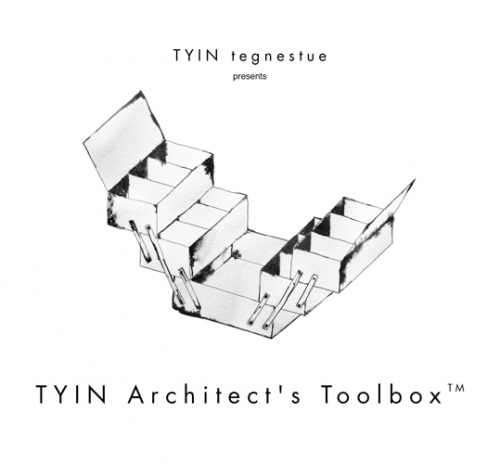 Your architecture and everyone involved will benefit from the use of TYIN Architect’s Toolbox™. TYIN Architect’s Toolbox™ contains practical tips on how to proceed with project with tight schedules, small budgets and limited resources. TYIN Architect’s Toolbox™ is developed by professionals through hands-on experience and field-tested under extreme conditions. It is sturdy and can easily be shipped by any mode of transport without danger to the contents.